The polar jets aren't content to rest on their laurels - they have interesting effects on the surrounding environment as well. 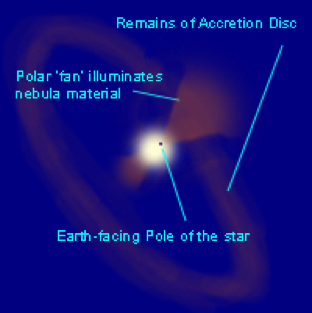 The energetic material, and the radiation, blasts into the gas cloud from which the star formed, and can actually set off more star formation. These jets can be several light-years in length and many are visible to us. 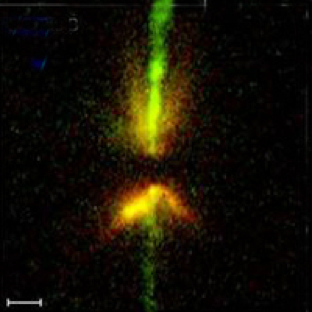 These are called Herbig-Haro Objects after the astronomers who first called attention to them. Sometimes we can see the whole thing - the dark disc (no longer hot enough to shine but still opaque enough to hide the actual star) the polar jets and an illuminated nebula. The picture here is the environment of DG Tau (we have a chart for it!) and the scale at bottom right is 200 AU, which gives you some idea of the size of the disc. Note how the brightness of the 'fans' falls off with distance. Here we are looking practically equator-on to the system. A google search for images of H-H objects will quickly demonstrate that they come in all shapes and sizes, since nearby stars - which may themselves be forming - can affect the shape of the jets. Why should I observe them? They are interesting, and even exciting! Some show extremely rapid variations, every bit as rapid as U Gem stars, sometimes even more so. Professional astronomers are interested in them. YSOs can provide most of the information about how planetary systems form, which naturally has implications for the search for exoplanets, life in the universe, and so on. But aren't they faint and obscure? I've only got a 6" newtonian! Some are, of course. But with your 6" scope you could observe some really interesting and active stars like CQ tau, RW Aur, YZ Cep and many others. AB Aurigae is visible with binoculars at all times!